The people who followed Jesus fell in love with him. They fell in love with God through him. Their rich living came as they lived lives trying to walk in the steps of their teacher, mentor, and friend. Following his death, as they tried to continue to live out his love, they formed “churches” that followed his teachings and example. In Acts 6 we see the church was established but then encountered a small problem. The Greek widows were being overlooked in the distribution of food. The church was failing to care for those in need. The generosity of Christ was not being lived out and it was evident for all to see. 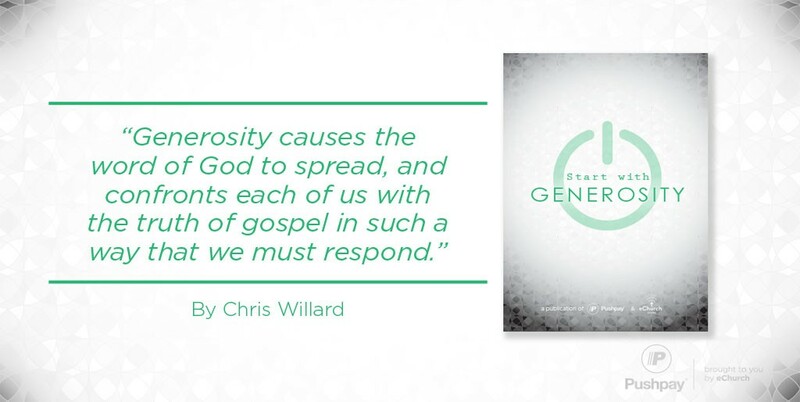 The church leaders put a plan in place to solve the generosity problem . . . yet in scripture we do not get a blueprint of that plan. Rather all we can read is, “So the word of God spread. The number of disciples in Jerusalem increased rapidly, and a large number of priests became obedient to the faith.” Acts 6:7. We end up being confronted by the truth of the gospel lived out in love. That truth changes something in us that causes and pushes us to respond. If we tell our story by LIVING out the love of Christ in how we care for those in need, the energy is contagious. It is the living, the actions, that is the answer to the generosity problem. Not just some words that we say. Who is someone you see that needs some love? Maybe someone that is hurting, someone feeling alone, someone who needs a little more concern than normal? Instead of just “saying” – “I’m thinking about you” or “I’m here for you” – – – DO something. Write it down on a card. Give them a flower or chocolate. It is the small acts of kindness that show great, life-changing love. (Borrowed from Mother Theresa).